A lightweight breathable thermal coatthat retainsheat by reflection. In fact it reflectsback 95% of escaping heat. 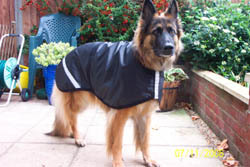 With an outer coverof extra tough shower proof nylon and a smart burgundy poly/cotton lining your dog will stay warm even if wetdue due to it's unique properties. It can be put directly on a wet shivering animal and theywill start to feel warm within seconds, andremain warm even as the coat dries out since the material is BREATHABLE. This coat is for an 'A' measurement of 30 inches. Please ensure you measure your dog before ordering.